So one of the major recent food news in Korea has been Shake Shack's announcement of its pending entry into Korea's capital in 2016. It's a move that I wasn't all too surprised with seeing how Korea's demand for premium burgers, beers, and the likes have seen even McDonald's launching a premium burger joint in Seoul as well. Food distributors have been really upping their importing of various famous global restaurants in recent years including Lawry's, Texas de Brazil, Magnolia Bakery, and even Panda Express to Seoul. And with Shake Shack now arriving, the divide for many American expats between here and home, is closing up a bit more (though I'm sure we'll have to see how the Shake Shacks in Korea are in quality and taste when they open). 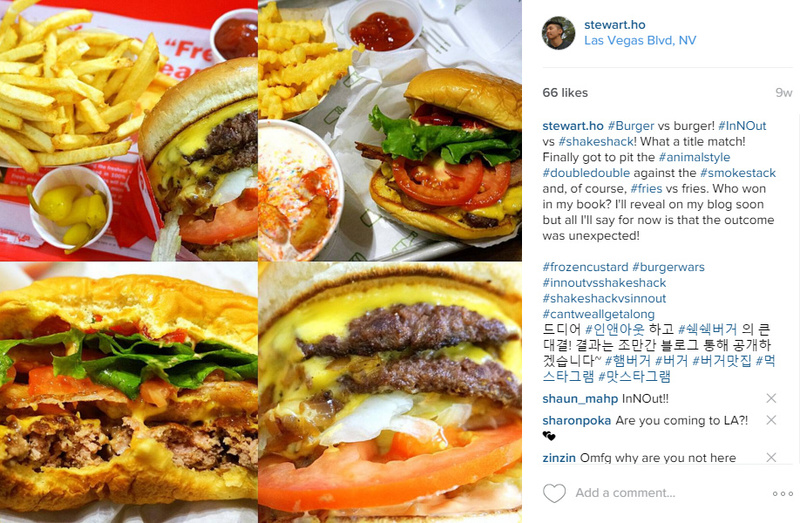 In honor of its arrival, I'm going to get back around to posting my thoughts on my In-N-Out vs. Shake Shack match I had back a while ago. So the set-up was this- I was suddenly thrust into Sin City for work and trying to see what eats I could do in the short amount of time. Knowing full well I needed to get my usual In-N-Out fix, I was searching for the nearest locations to my hotel when I came across the fact that Shake Shack had also recently rolled into town there. Though I had a limited number of meals I could do on my trip, I knew I had to take advantage of this aligning of the stars, so to speak, so I decided to do a taste test. For this little test, I I tried to approach my test in a fair way; both meals were split over two separate days (to minimize burger fatigue) and at both places I would go with a popular burger with fries. Now, this wasn't a completely scientific test by any means and, in fact, as someone who lived in LA for 4+ years, I had a bit of a bias towards In-N-Out. Having only heard of Shake Shack and its growing followers over the years though it seemed like a legendary bout on par with King Kong and Godzilla. I went with the In-N-Out first only because I had a crazy hankering for it after having it last 2 years prior. Despite it being close to 10 PM on my visit, the one I went to was nearly packed and a line already in place. Like every In-N-Out visit, the person working the cash register was not only friendly but attentive, making sure I was getting exactly what I ordered. And yes indeed, I got what I wanted. My standard is always a double double, animal style, with fries and peppers on the side. When the lines aren't too crazy and I also have a bit of leisure, I like to ask for my fries a little undercooked (soft fries for the win!) and include the peppers diced into my double double but I wasn't feeling like going too crazy. True to In-N-Out's style, my order took a while to come out as all burger and fries are made to order. But the wait is always worth it as evidenced by this beautiful godsend, served on a bright red tray. Given the fact that it's a humble burger, you've got to give credit to In-N-Out for always managing to make a burger meal look so fine. The way the burger is just neatly packaged- just slightly agape, each layer so methodically placed- the way each fry is a perfect golden color... really, what a sight to behold. Now when it comes to fries, the ones at In-N-Out are fine enough. With the option of having them cooked to how you like them (crispy vs. softer) or even animal style, they really make it a point to get your fries the way you want them. But everything and anything here is about the burger. "Fresh" is the word that springs to mind here such as the crisp iceberg lettuce and juicy tomato slice. Then there's the beef patties which are just grilled expertly to give that nice semi-char on the outside while locking in all the flavors and juices inside. As if that isn't enough, then you get the melted cheese, spread on the buns (pan grilled buns, no less) and when you get that animal style on it with the bits of onion and whatnot, it's just heaven in food form. No real surprises. In-N-Out knows quality and always delivers it to customers so they know they can always, always, get a top notch burger. So then the next day was the day of reckoning- my first Shake Shack experience. Being the In-N-Out fan I was, I went in expecting In-N-Out to just flatten the competition. The LV location is on the main strip in New York New York and was bustlin with people on my visit. At Shake Shack, the menu is quite more extensive going beyond just burgers but hot dogs, frozen custards, mixed drinks and more. Initially I wanted to compare with similar burgers by going with the Shack Stack or the ShackBurger as a double. It came to my turn and I was greeted by a super friendly girl working the register. On letting her know it was my first Shake Shack experience and asking her recommendation, she enthusiastically pointed to the SmokeShack so that's what I went with, along with an order of their crinkle cut fries and a Jackpot frozen custard with mix in (or "Concretes" as they're called here). Price-wise Shake Shack was the premium of the two. Even if I had ordered a shake on top of my double double set, it would have roughly been the price of a double Smoke Shack alone. Slightly higher expectations? A bit. Like In-N-Out, the kitchen starts preparing your food after you order so it took quite a few minutes for my order to come out but out it came finally. The SmokeShack is like a premium version of the cheeseburger here topped with all-natural applewood smoke bacon strips and chopped cherry peppers. Distinctively, the burger here wasn't all prettily packaged but came agape, top bun slightly ajar to reveal its contents. The squishy potato bun is also a distinction from its west coast burger peer which does though also come toasted. If you notice, the order of the burger's layering differs between In-N-Out and Shake Shack. From bottom to top, In-N-Out goes spread, veggies, meat, cheese, and animal style spread. Shake Shack reverses it with meat and cheese on the bottom, then vegetables, then spread. Taking my first bite, I chewed a bit and then chewed some more which is when I started to realize what Shake Shack's burgers' merits were. It wasn't love at first bite but when you work out the ingredients it's simply a great mixture in texture and flavor. The chewy and soft potato bun, the smashed patty with the charred salt bits, the smokey bacon strips, green lettuce leafs. I especially was a fan of the chopped peppers which, you can also get at In-N-Out, but these cherry peppers have a bit of a sweet edge which gives it an intriguing edge. I was wondering about the layering of Shake Shack's burger but as I ate, I realized why. The burger's star is always about the patty and by layering it on the bottom, you get taste whammed by the big guy first before letting the other ingredients come through in a second wave on your taste buds. And can we mention that the other ingredients were not only surprisingly decent but fresh as well? The tomato was juicy and just firm enough and I was also impressed at how even the green leaf lettuce made a contribution with a taste and texture that was far more appealing than iceberg lettuce. Seriously, when's the last time since an iceberg lettuce salad, that the watery green has made a serious flavorful contribution? As I munched through my burger, my respect for it grew. This was no gimmick or fad. The Shake Shack's burgers reputation was sound and with merit. Bravo. Fries are just about my favorite guilty pleasure food but I do have a ranking of my favorite variety and crinkle cut, admittedly, is a bit lower on the totem pole... somewhere above tater tots. But that doesn't mean I've come across a fried spud in any form that I didn't like and I enjoyed the fries here enough- freshly fried, hot, salted. It's fine enough but, like the fries at In-N-Out, take a far lesser billing than the burger. I normally wouldn't order the frozen custard as I'm not a sweet fan in general but I knew I had to give it a try since I wouldn't know when's the next time I'd be able to try Shake Shack out again. The Jackpot is described as being a frozen vanilla custard with strawberry puree, marshmallow sauce, Belgian waffle pieces, and rainbow sprinkles. Visually it ain't exactly a pretty sight... almost looks like a melted fairy tale unicorn of sorts. Taste-wise, I wasn't a fan. The vanilla custard was sweet in itself but with the addition of the strawberry puree, marshmallow sauce, AND the waffle pieces (which are fried no less). It's just a bit of too much in one little cup. Towards the end, I was actually struggling to finish the saccharine soup but which I did because I felt guilty about spending five bucks on it alone. It's hard to say. I walked out quite satisfied with Shake Shack but also somewhat oddly torn and with mixed feelings. Almost like that weird gut feeling you get when you meet the next person after your first love (No? Anyone?). In my mind there was a bit of personification in the respective burgers in terms of their home turf roots. The In-N-Out burger knows it’s a fine burger and it makes a point to show off its assets. It knows it’s a looker and isn’t afraid to flaunt it, even as prettily packaged as it is, and see you’re admiring her in full glory as well. The Shake Shack burger is like this gruff, “I am what I am”, burger who doesn’t bother to fancy itself up because it knows its makeup is solid and with pedigree. You find intriguingly there are several layers to it within that's a delight to uncover as you get to know it. I was surprised as I thought for sure In-N-Out would have the upper hand on this one but the quality of the toppings at Shake Shack was better in its offering and quality. I haven’t paid much attention to the buns before at In-N-Out but the potato buns at Shake Shack is a great addition giving the burger an additional delicate flavor profile and its chewy texture just a delight overall. The animal style spread isn’t a gimmick. It’s probably one of the greatest spreads to a beef patty that’s been invented. The chopped cherry peppers for the Smoke Shack (and I believe, only in the Smoke Shack) is muy excellente and I think if I was a Shake Shack regular, I’d order it on all my burgers. But even that doesn’t compare to the way an animal style spread provides depth to a burger without overpowering it. Both the patties at the respective burger joints have that flat, crisp-on-the-outside, juicy-on-the-inside thing going for them and with good reason. I don’t have to play like a python about to consume a full grown buck with a ridiculously oversized patty and both patties are flavored and cooked just right. I will say Shake Shack plays it better in terms of putting the patty on the bottom layer of the burger to get your tongue meeting the patty first. But only really because you can customize In-N-Out fry orders. I know the crinkle cut fries at Shake Shack have a big following, especially since they reinvented the recipe but I think the fries at In-N-Out highlights the fresh cut fries in flavor and texture better. But really, a miniscule difference between the two in my opinion. Price-wise, In-N-Out has the edge. I don’t know the full details of the ingredient breakdown of both places and which has the “better” quality beef and such but the vast majority of customers at a burger joint really doesn’t take that into consideration and if it’s a good burger that’s a good price, that’s gonna be one of the main deciding factors. With all the incentives and benefits In-N-Out offers, the workers at In-N-Out are jolly, friendly and genuinely seem to care about you getting what you want. I’m not sure about what the employee experience is like at Shake Shack but based on my one visit to the LV location, I was happy to see everyone was super chill, friendly and helpful as well. So... I don’t know. My hands are in the air if you’re pressing me for a clear choice between the two. I suppose because of my long love and appreciation for it, In-N-Out has more of my heart. But heart doesn’t really factor into choosing between two fast food joints and so, when it comes to assessing with my stomach, I really have to say it’s an even tie at this point. If we’re getting nitpicky here though, this is an assessment based on my uncountable visits to In-N-Out in the past versus one sole visit to a Shake Shack a few months ago. On the other hand, I suppose the fact that one visit to Shake Shack alone left me impressed to this level is quite a sign as well. With that, I’ll leave my verdict as a “to be continued”. Another visit or two to Shake Shack to explore it further I think is needed. Given that Shake Shack is now coming to Korea apparently though, and assuming the quality and taste is uniform, I guess I’ll be able to make up my mind sooner rather than later. I know, I know, rather quite anticlimactic but it is what it is. If one can wait decades for a new Star Wars trilogy to kick up, I’m sure you can wait on this as well. The one conclusion I can make though is this: both In-N-Out and Shake Shack have a deserved reputation and following.